A Day in First Grade | Reading takes you places! The countdown is on. My room is SO close to being finished and I’m now onto the planning, prepping, copying, and laminating phase. Today at school I decided to tackle my saving grace during the first week of school. Seriously. My picture books are my security blanket, my saving grace, and my ‘QUICK, WE NEED SOMETHING TO DO’ all year long. I’m not going to lie, I love reading and I love sharing books that I love with my students. 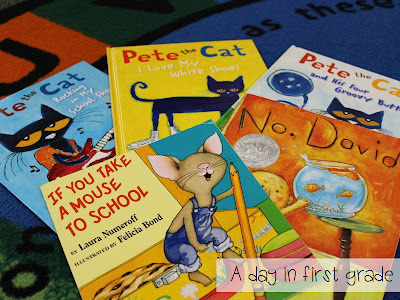 During the first week of school, I use so many great books to teach invaluable lessons to my new first graders. 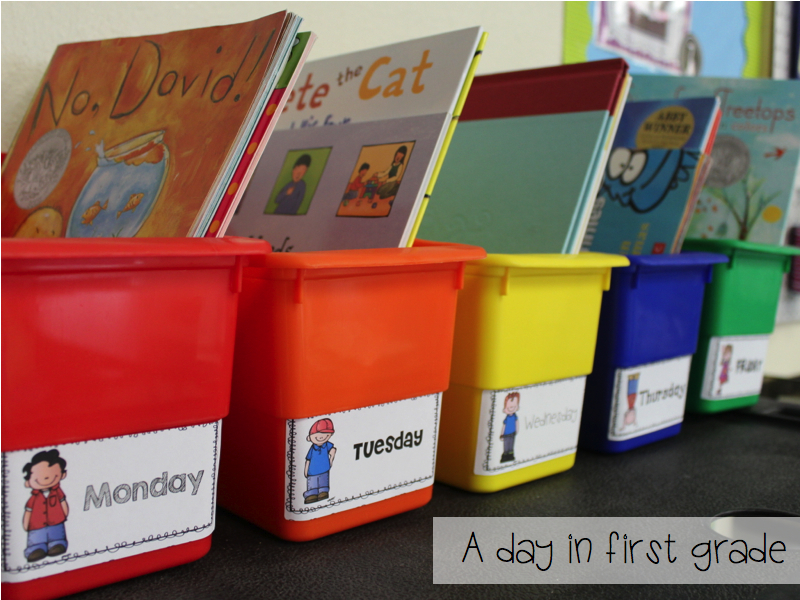 I have a black cart near my door and on top of it I have 5 “book boxes.” Each book box represents a day of the week. I then place all the picture books, worksheets, games etc. for each day in the box. These boxes are so great to help me stay organized. They’re also great because I do all my prep work (copying etc.) on Fridays and then sort them and then I’m ready to go for the whole week! So today, I began putting in my “go to” read alouds in my boxes. I’m sure you all read these to your students. But I also love these books! I emphasize in my classroom that we are a FAMILY. We begin developing a community the very first day of school. I especially emphasize the “Words are not for hurting” lesson this day. I’m sure you are very familiar with these famous characters below, too. If you are not, please, please, please, RUN! don’t walk to your nearest Barnes and Noble and buy yourself a copy of each of these books!! My students LOOOOOVE these characters and they read these books over and over and over again during Daily 5! Speaking of Daily 5, one of my very first lessons that I teach my students is how we can read a book. I teach them that there are THREE ways that we can read a book. We can read the words, we can retell the story, or we can read the pictures. I am a huge advocate for modeling lessons and expectations. 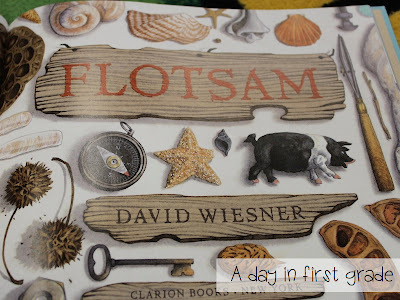 I use the book “Flotsam” to model how we can read the pictures of a book. Flotsam is by far one of my favorite books to teach this lesson as the book has no words! Instead, it has the most intricate pictures that students LOVE. 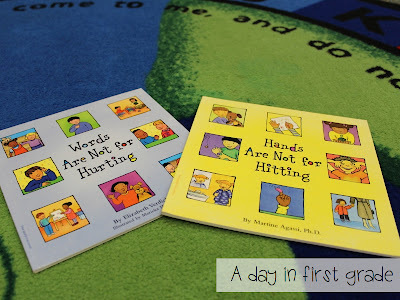 I model how I would read the pictures of this story and then, I pick one very special friend to have this book in his or her book box for the day. 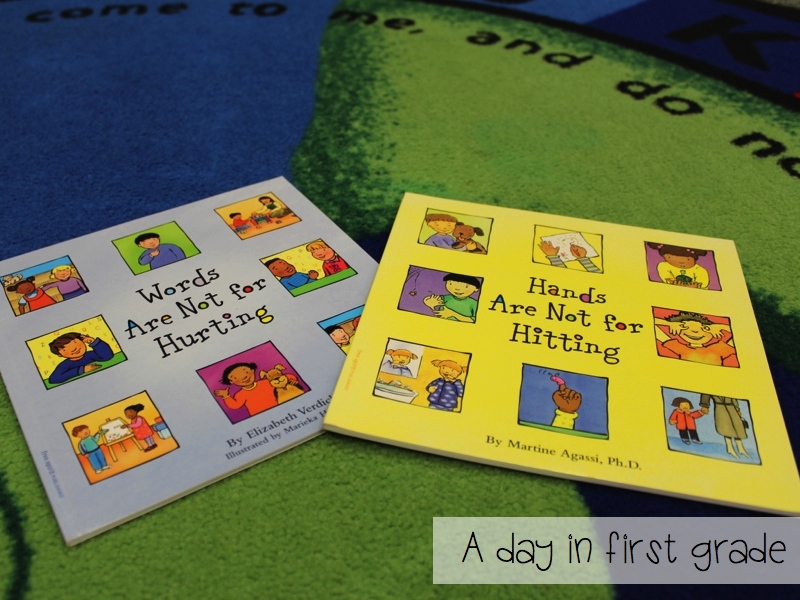 Each day, I give away this beloved book to a student until everyone has had a turn with it. They love this. The last book I want to show you today is called, “The Other Side.” When I was in college, I took a class all about picture books. It was by far the best class I took. The professor would read us fabulous children’s literature and taught me so much. In fact, it’s the reason why I hold books in such high esteem. One of our very first assignments was to go to a book store and buy at least 5 multicultural literature books. The professor made the point that every student in your class is going to want to see themselves in the books. This struck such a huge chord inside of me and that day I vowed that my library (and clip art!) would represent all the students we teach. 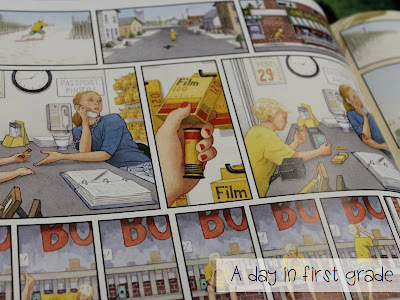 This picture book is lovely and I feel portrays a very important lesson during the first week of school. 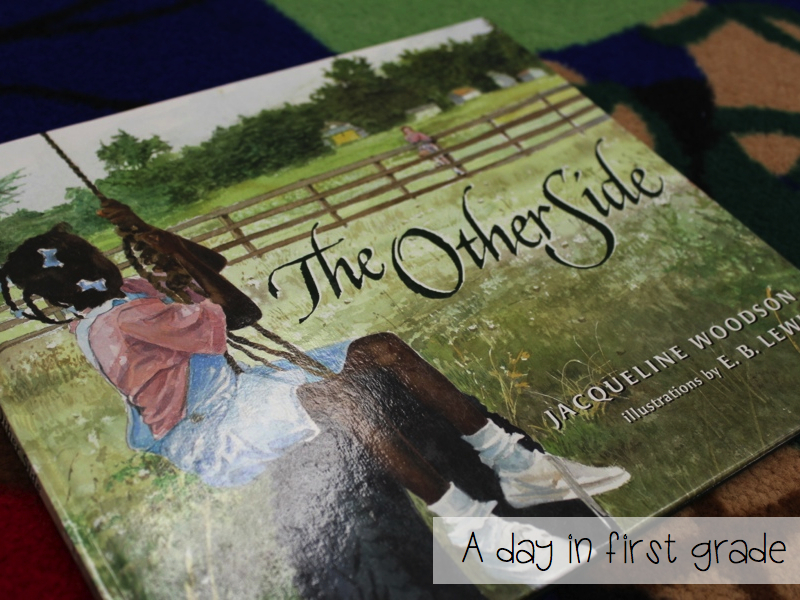 It tells the beautifully hard story of an African American girl who lives on one side of a fence. Her neighbor is a young Caucasian girl. It tells the story of how their mothers both told them to never cross the fence and in the end shows how these two girls become friends. It is so sweet and well illustrated. 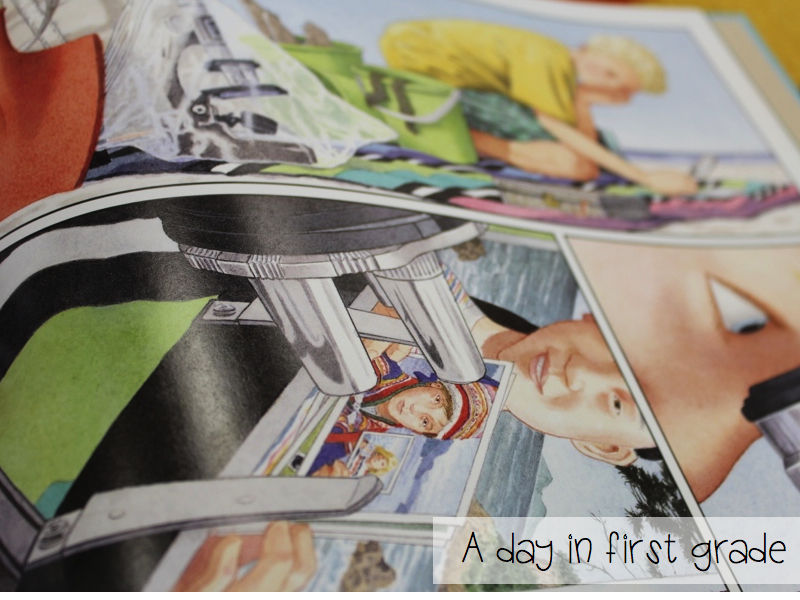 I love the themes of friendship and compassion that are taught throughout the pages. I make it a point to teach my students that we are all in one big family at school and we always are kind and loving to each other. We talk about how we should treat each other and how we can treat our friends well. I love the sweet comments that first graders make during this lesson. There are many other books that we read during the first week; however, I hope that this post shared some new books with you or affirmed some old favorites!! Also, I’m happy to say that Robin you were the winner of my “Mastering Number Concepts” pack! I’m emailing you right now! Love all of those books! Flotsam is one of my FAVES!!!!! I have a huge classroom library with a TON of read alouds…we have a reading series though that comes with stories and an anthology so I am unfortunately not able to incorporate as many of my read alouds as I want to! 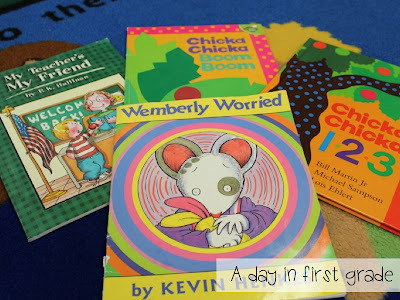 I have been really looking for read alouds to add to my content area subjects and during my “review” days, I always add one of my read alouds from my teacher library!!!!! Love how you organize them! I used to have them organized by month or theme but I think I may have to organize them even more!!!! Thanks for the information!!!! This was a great post. I love Flotsam. 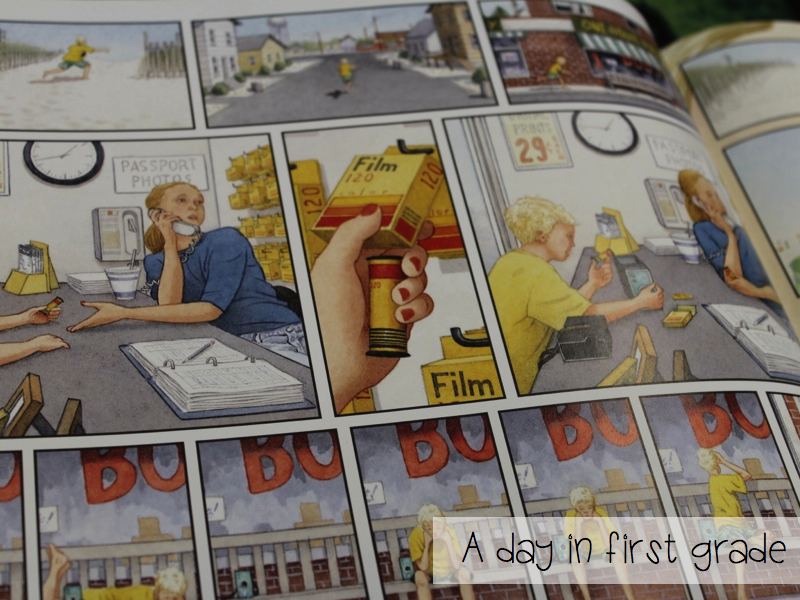 Wordless books are so fun. I’ve never heard of Flotsam; I’ll have to check it out! I love The Other Side though! Such a great book!! One of my classes in college showed me the importance of finding books that show everyone in a positive way (no stereotypes allowed!!) so I also try really hard to find books that show differences. And it can be super tricky!! Your book boxes are a great idea! I love useful organizational tips! I really enjoyed this post, probably because you weren’t posting about a new product, but you were just sharing 🙂 I’m super organized too, but don’t have anything for my weekly read alouds, so this idea is AWESOME! I love to discover new books, and your post mentioned some that I’m not familiar with, so thanks for that too!